Blue Cypress essential oil supports a healthy respiratory system*. Traditionally it has been used to be supportive of the body’s natural response to irritation; as well as aiding normal breathing. The Australian Aborigines burned the heart wood to repel mosquitoes and midges; and also used it to moisturize dry skin in the desert environment. The oil is a magnificent azure blue color! This comes from guaiol and guaiazulene which are known to reduce the body's response to irritation. It is the only wood that contains these components. This oil also has historical use as an additive in perfumes for its stabilizing properties. My favorite oil blends that contain Blue Cypress Brain Power and Australian Blue Essential Oil. As I receive new tips and testimonials for Blue Cypress Essential Oil they will be added to the page, so check back frequently! 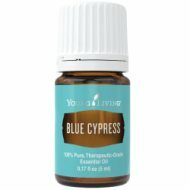 Want to Purchase Therapeutic Grade Blue Cypress Essential Oil? Go to the Oil Shop! Buy Blue Cypress Oil at The Oil Shop! What is the Genus Species? Callitris intratopica. Did you know that the Australian aboriginal people burned the wood to repel mosquitoes and midges? What are the Plant Properties? Soothing and warming. What are the Documented Uses and Benefits of Blue Cypress Essential Oil? Supports the respiratory system*. Moisturizes healthy dry skin. What is the Aromatic Affect on the Mind? Its woody and spicy aroma is grounding and balancing. What is the Spiritual and Emotional Influence? Blue cypress releases the emotions of pessimistic, rampage and ruthlessness. It releases irritation on a mental and physical level. It has a cooling effect on emotions because it physically release irritation. On the positive side, this oil helps us feel empowered by helping us see how we are distinct in our own unique way and supporting us to perform in this ability by grounding our emotions. This oil is mainly sesquiterpenes which oxygenates cells thereby giving us clarity of thought. What are the Safety Precautions? There is no specific safety data available at this time. Dilution not required except for the most sensitive skin. Did you know that Blue Cypress is sometimes called the ABC Oil? Yes, for Australian Blue Cypress! Smell this oil to refresh the mind and ease irritation.